Just a few days after Guru's warning to me -- and with Celebrations underway -- I turned 22. It was bittersweet. On the one hand, I was still bumming about Guru's warning. On the other hand, Jeevan and Liz were in town and I was happy to see them. They were upbeat and inspired -- just the antidote I needed. On the night of my birthday, there was a function at P.S. 86. Near the end of the night, I was standing in the back of the school's auditorium commiserating with Jeevan and Liz. Liz had brought a bag of birthday gifts which were wonderful -- the first birthday gifts I'd received in a long time. Then Guru -- sitting in a reclining chair in front of the stage at the front of the auditorium -- pulled his microphone over and called my name. I took off my shoes and then jogged up to Guru's chair. He had a rose in his hand and beckoned me closer. 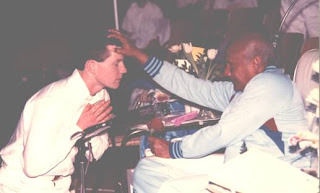 I kneeled before him with folded hands and he placed his right hand on my head. The blessing lasted just a minute or so, but its effect turned things around for me. Forgotten was the sting of the previous week's warning. Afterwards, I just wanted to be alone. And for the next three or for days, it felt like my nerves were physically buzzing. But I just couldn't shake the sense of unfairness that I felt from Guru's warning. I really felt that Guru should have given those who had complained about me and Jayanti the what for. In hindsight, however, I now look at that warning as a mother bird's first peck at her chick to get out of the nest. As I've said, that experience caused a permanent crack in my Center oriented personality, but I didn't know that at the time. Even though Guru's warning shocked me, I loved Guru and loved being in the Center. I think that shows in my birthday picture, above. I loved nothing more than running over to the tennis court after work to throw balls or to suit up into my whites and go to meditation.